D.J. Abson, H. von Wehrden, S. Baumgärtner, J. Fischer, J. Hanspach, W. Härdtle, H. Heinrichs, A.M. Klein, D.J. Lang, P. Martens, D. Walmsley, Ecosystem services as a boundary object for sustainability, Ecological Economics, 103, p29-37. The ecosystem services concept is one of those rare beasts in sustainability science a ‘path breaking idea’. Some 30 years after the term was coined it is increasingly influential in how scientists, and crucially decisionmakers, think about human-environment interactions and interdependencies. While it is pretty obvious that the ecosystem services concept is ‘breaking’ traditional ideas about conservation and humanity relations with nature, it is not clear to what ‘path’ the concept is taking us on. Motivated by this question I and a number of colleagues at the FuturES research centre at Leuphana sought to assess how the ecosystems services concept has developed. In particular, we were interested in whether the concept’s original strong normative motivations –human well-being, conservation– has allowed it to act as an effective boundary object for the integration of the diverse fields of scientific knowledge and how the science relates to understandings of sustainability. Question 1: Is the ecosystem service concept is drawing together and synthesising the understandings of the multiple scientific fields that engage in this research field? Our findings suggest that while the field has become more diverse over time, it has not coalesced in to an integrated body of knowledge. We identified a conceptual vocabulary of approximately unique 500 words within the 1,388 papers that were used to identify the ‘conceptual landscape’ of ecosystem services research. There are two clear conceptual gradients within the research field: a social science – natural science gradient and a policy relevance – fundamental research gradient with almost no shared conceptual vocabulary between the ends of these two gradients (see Figure 1). Moreover we identified nine distinct research clusters within the publication, each with their own distinct conceptual vocabulary. Contrary to Richard Norgaard’s assertion that the ecosystem services concept has shifted from “an eye opening metaphor to a complexity blinder”, we find that the span of ecosystem services research is not blind to complexity, but rather the complexity remains ‘hidden’ within disciplinary silos. Figure 1 Full text analysis of well-cited publications on ecosystem services (N = 1,388), published between 1997 and 2011. 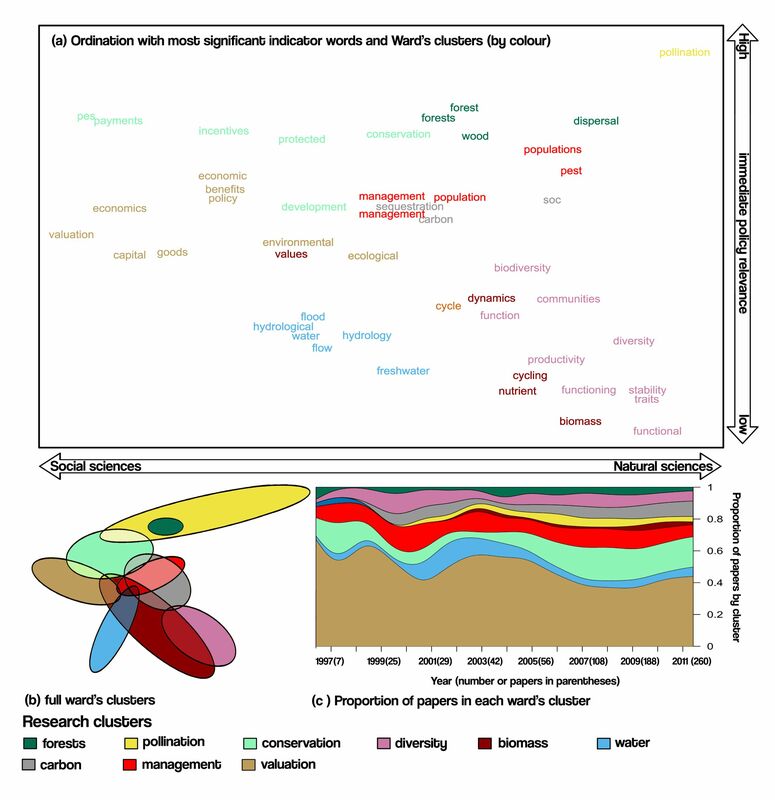 Ordination and clustering of publications, showing: (a) the most significant conceptual keywords for each cluster, (b) the shape of the full Ward’s clusters of publications in ordination space, and (c) the proportion of publications in each research cluster by year. Research clusters near one another shared a larger set of conceptual keywords. Question 2: To what extent is ecosystem services research generating knowledge that allows for the sustainable management of human-environmental interactions? Again our research suggests not as much as it could. We identified terms that relate to three key types of knowledge that are necessary for sustainable management of these human-environmental interactions: Systems knowledge relates to a descriptive understanding of social and ecological system functioning (how the world is). Normative knowledge provides understanding on what is, or how to judge, desired system states (how the world ought to be). Transformative knowledge is needed to develop tangible strategies to manage ecosystems (how to change the world). We found that the majority of the different research cluster are primarily focused on generating systems knowledge with relatively little concern for either normative or transformative knowledge (see Figure 2). In other words we have an increasingly sophisticated, if fragmented, descriptive understanding of human-environmental interaction’s, but a relatively poor understanding of our goals in managing such interactions or how to intervene to achieve those goals. In particular there is a worrying lack of engagement with the ethical foundations of ecosystem services research. Figure 2. 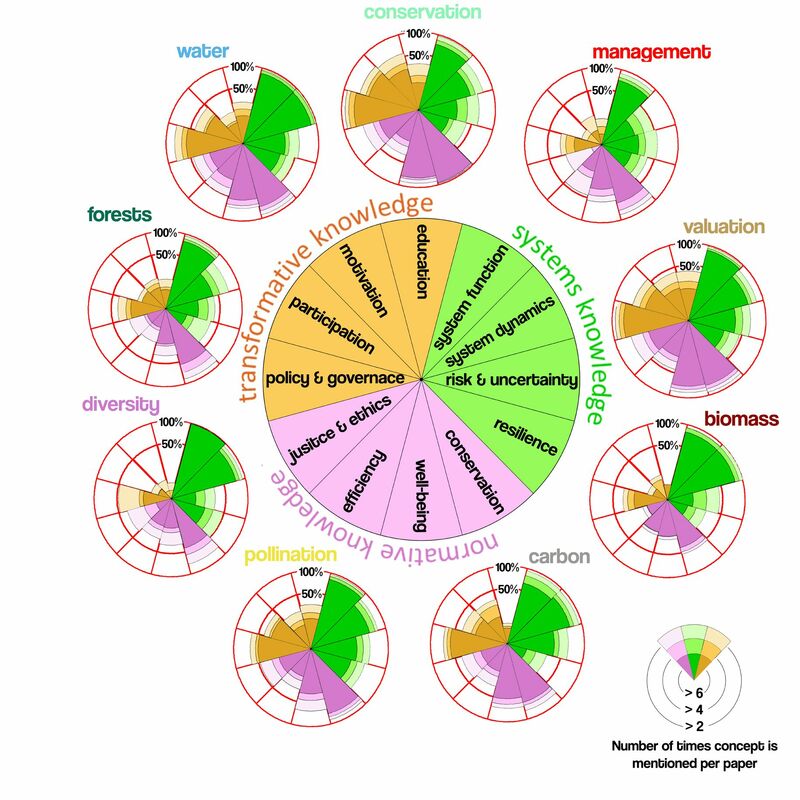 The percentage of individual publications within each ecosystem services research cluster that used sustainability vocabulary related to systems knowledge, normative knowledge, and transformative knowledge. Darker shades indicate publications with more common use of a particular subset of the vocabulary. 1) Ecosystem services research requires better interdisciplinary knowledge integration. The fragmented nature of ecosystem services research is potentially problematic because systems knowledge must integrate a wide range of complex relations and feedbacks between social and ecological functions if we are to better understand and manage the interdependencies between ecological functioning and human well-being. 2) We need a greater focus on normative knowledge.While descriptive, systems knowledge is undoubtedly important, an increasingly detailed understanding of systems dynamics does not provide the necessary tools for societal judgments regarding whether specific changes can be deemed “good”. A danger therefore remains that judgements regarding the “good” management of ecosystems are based on implicit normative assumptions built into particular research approaches (e.g. monetary valuation methods). Normative knowledge can help ensure that systems descriptions are meaningful in the context of achieving the societal goals and to avoid the pitfall of the ecosystem services concept becoming a technocratic discourse. 3) Ecosystem services can act as a transformative tool. The current emphasis on systems understanding needs to be matched by transformative knowledge that relates explicitly stated normative goals to the processes required to achieve those goals. As a transformative concept, ecosystem services will need to engage not only with literature on governance, but also with work on engagement, motivation, communication and education, themes that, to date, remain marginal within the ecosystem services literature. As ecosystem services research is increasingly being promoted as a management tool, there is a need to more fully and carefully consider the role of normative knowledge, in both the conceptualization of ecosystem services as a scientific concept, and as a means of guiding the enhancement of both systems knowledge and transformative knowledge. Our research suggests that problem-oriented and systems-based approaches to ecosystem services research (as opposed to more traditional disciplinary approaches) have most successfully created spaces where the knowledge from multiple disciplines is integrated and where normative and transformative knowledge is most actively pursued. ← Resilience: From a theoretical concept towards a global paradigm? Critical reflections on the Resilience Conference 2014. Amazing piece of work by my friend Dave Abson and colleagues, with important messages to ecological researchers.